New Year's Resolutions aren't just for individuals, they're for families too! I know what your thinking. It is hard enough to keep my own personal resolutions and goals. Why would I want to set goals with my family too? Why? Because setting goals together, and working towards those goals, brings us closer as a family. It builds trust, unity, and is a great opportunity to teach our children values and skills. Research shows that by the first week of February, only 50 percent of us will still be keeping our resolutions. Don't let your family become a statistic. Whether you have a word of the year, make New Year's resolutions, or just have a few goals you want your family to work on this year, here are a few tips to help your family stick with those resolutions so you can grow and improve together. 1. Make your resolutions something that YOUR FAMILY really wants. Your family's goals and resolutions should NOT be something you think you should do as a family. Or something that you are doing just to keep up with what you see on Pinterest, the internet, or that your neighbors are doing. Honestly evaluate what is best for your family. One of the biggest mistakes families make is making resolutions to keep up with "the Jones' " Don't worry about what other families are doing. 2. Make sure your eyes aren't bigger than you stomach. AKA, don't set too many goals. In fact, two or three is perfect for your family. Too many and they get hard to keep and focus on. 3. Goals should be specific. For example, "Save money", is a good goal. But it is not specific. "Save 5 dollars a week" is a better goal. Being specific makes the resolutions more do-able and makes it easier for everyone to understand what is expected. 4. Leave room for forgiveness. No family is perfect and there will be many times when we falter on our resolutions. That is normal. The difference between those families who reach their goals and those who don't, is the way they react to set backs. Instead of throwing in the towel, problem solve. Then you can rebound and get back on track. 6. Create short term goals to keep you accountable. We hear this all the time, because it is true. As a family, set a resolution, and then set short term goals to help you along the way. Your family will be much more likely to achieve your goals that way. 7. Make it fun and celebrate! Whoever said resolutions have to be boring? Find fun ways to achieve your goals and celebrate your milestones along the way. This also helps to keep it fresh in everyones mind. Because a year can seem like a really long time. Looking for a fun way to set resolutions for your family? Create a vision board! Have each member of your family sit down with old magazines, newspapers, markers and crayons, even the computer. Have everyone cut out or print off pictures, words, phrases that represent what they see for 2014 for the family. Put them all on a big piece of cardboard. Then, step back and evaluate the themes that are most prevalent on the board. Use the common themes to create two or three resolutions to best benefit your family this upcoming year. And remember, everyones resolutions look different, just like our families. And that is okay. I would love to hear what your family resolutions are for this year? This post was written by me, and was originally posted as a guest post on TheIdeaRoom.net. We are trying to unplug more. On Sunday nights we take turns choosing board or card games and everybody has to play. Sometimes the kids fight but mostly we're having fun and none of us are looking at screens, so that's a win. Stopping by from SITS Girls Comment Love Tribe. These are great tips; thank you for sharing them. I love the idea of families doing resolutions together. It makes it so much more meaningful when everyone has input. Have a great day! These tips are very helpful. I love the idea of family goals - we really didn't make any this year, but now... maybe we will have to. My kids are still a little young to participate, but once they get a bit older, I think it is a great idea. 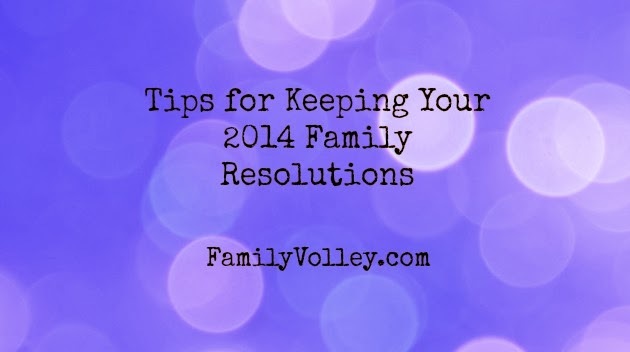 I love the idea of establishing a family resolution, and your tips on how to implement them are great. The vision board sounds like something we could all contribute to and get behind. We've quietly said we're going to eat less processed foods, and have started baking our own bread. We set one family goal this year and it was to go outside and play together as a family. Since we have such great weather year-round in Florida, we are able to work on this resolution. So far we have gone to the park every Sunday and spent the whole day there as a family. Hope fully, we can keep it up all year! This is a totally new idea to me and I think it is a very good one. Great tips for including the whole family. My only family resolution is to go on a family holiday. We've not been on one since our son was born 3 years ago. My husband hates leaving the farm (even though it is possible), so it's going to be a challenge. But we never make resolutions as a family. Hopefully once N is older and can input, then it'll be more important to discuss them together. These are excellent tips! When the little one is big enough, I'll definitely have these in mind. I totally agree with you, especially the one about not setting too many goals. We've done family goals for about five years now (my kids are 7, 7 and 10). They've mostly been related to our financial goals, and with the kids' help, we save up for day trips and bigger vacations. Their buy-in helped us to pay off all our debt last summer, and we all celebrated together. One of our goals this year is to teach the twins to ride bikes w/o training wheels and get bikes for Mom & Dad so we can all start riding together. I've never really thought of the idea of having family goals before. Great thinking! Found you via SITS! Thanks for these great tips on how to set family goals! Definitely something we need to work on! Stopping by from #SITSBlogging! I tried really hard to stick to my New Year Resolutions, but so far it hasn't happened, haha. You have some great tips though, I need to try them out to get myself back on track! These are great tips, especially about being "specific"- because you are right, you hold yourself more accountable when the goal is more defined. terrific tips. i especially like # 2 and #4. great post. I hadn't really thought about family goals in a long time. We used to have them when we had "big" kids but now we mostly have "little" kids. We used them before when planning for a vacation.